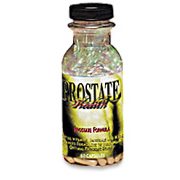 Prostate Health has been formulated with ingredients found to support the health of the prostate gland. MAXIMUM PROSTATE: Protects from getting uncontrollable prostate cell growth and helps to overcome abnormal cell growth in the prostate without undergoing the use of dangerous drugs. Take two capsules daily, as a dietary supplement. Warning: Not for use by persons under the age of 18. This product is not to be taken by pregnant or lactating women. If you are taking medication or have a medical condition, consult a physician before using this product. ** Daily Value not yet established. After using Maximum Prostate for 7 days my life has been changed. I now sleep soundly, my urination frequency is normal and the pain is gone! Send me 10 more bottles. Getting up 8 times a night to 0 the 2nd day on the product and continuing. All urination symptoms, urgency, frequency, low flow, dribble gone after 2 days on the product. Went off the Flomax drug because of side effects and not working that well, had to get up 8 -10 times until first night on the product, I slept through the night for the first time in many years. Prostate Health is shipped in a discrete, unmarked package. Orders are processed immediately and usually take about 3 to 5 working days to be received. We do ask that you try it for 2 to 3 weeks to feel the full effects. Any information received is used only for order processing and shipping purposes. Your information, such as e-mail address, will never be disclosed to a third party.